This is a story about muffin tops, intentions, art, and rainbows. Yes, those muffin tops. The kind you jiggle in front of the mirror and make scrunched up faces at. I had a conversation with mine recently. I said, what gives little muffin top? I am doing yoga and swimming almost daily — which is wonderful in and of itself, don’t get me wrong — but why is it that I am shedding weight everywhere except RIGHT HERE IN THE OL’ MID-SECTION? Obscure 30 Rock reference. GIF source. The answer surprised me: I don’t want to let go. This weight, after all, was from a pregnancy that I lost at nine weeks. The more I sat with this the more I knew deep down that I hadn’t released all the pain. That a bit of loss remained. I did what I often do in cases like this. I ran and hid. Just kidding! No, I decided I’d start small. I added an intention that I would remind myself of when I prayer or meditated. I would like to honor this baby that was not meant to be, and shed what no longer serves me. If there is one thing I have learned from years of therapy it is this: intentions are powerful. If you yell, “Hey universe! I am ready for some HEALING!! Bring it on!” oh my goodness you must be prepared for ALL the sh*t to fall upon you. Well, the sh*t grief came like I knew it would. My old friend grief. Yesterday I woke up cranky and sad. I tried to write. Nothing. I decided to clean (not my typical coping technique but hey, why not). I folded and sorted laundry. This felt good. (Unusual, but good.) Then something happened. As I was putting away clean clothes (again: AMAZING), I realized I had a bunch of shirts and pants I never wore. A-HA!They were clothes that reminded me of the miscarriage. The dress I wore for Easter. The shirt I bought knowing it would look good on me pregnant. The pants purchased right after the miscarriage. It was time to let these go. I packed it all up and donated it to Good Will. It felt really good. Grief, however, was still lurking around. I knew this would require something different. I needed to do art. And not pretty art…no. I needed to just paint whatever popped in my head and put it on paper. Doodles, colors, you name it. I painted for a bit and started to feel the grief cloud lifting. What happened next was this: my dog whined to be let out. It is rainy season in Florida (picture any episode of Bloodline with rain), and my dog won’t do his business in the rain. Well, lucky for him the rain had subsided. I took him out onto the front lawn and stared into space. Suddenly something caught my eye. The downpour had created a huge puddle in our driveway and I saw…what was it, a rainbow in the reflection? I thought at first it must be from oil in the water. But this rainbow was so crisp and clear. I looked up. No rainbow. I looked behind me. No rainbow. I discovered that it extended over to the next block of houses. It was huge. I felt a rush of love–my mother’s love. Rainbows are a sign I associate with my mom. 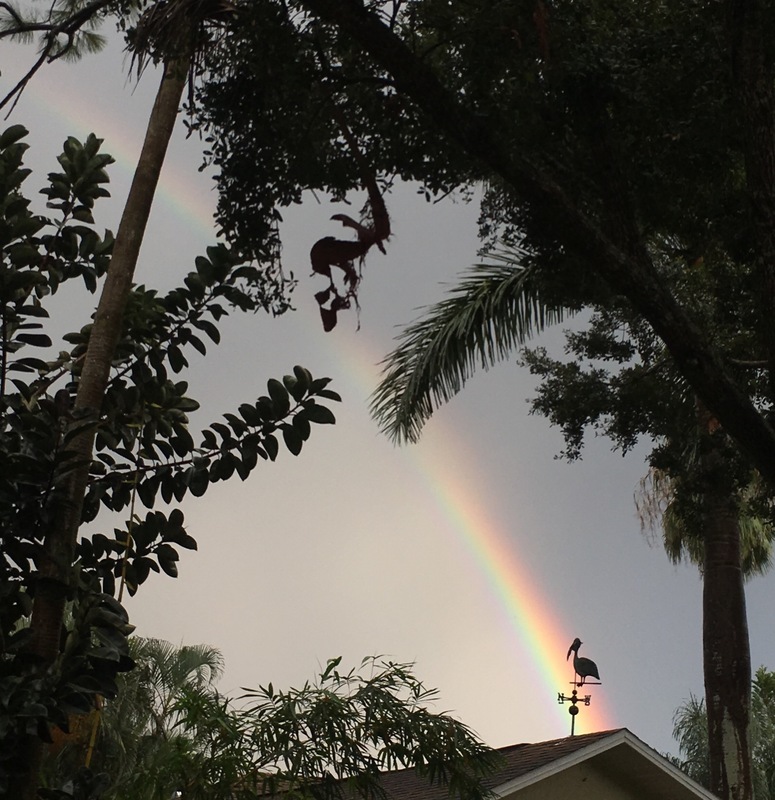 When she was first diagnosed with cancer we kept seeing rainbows at just the right time. Riding to the hospital with my dad and sister to see my mom after a surgery. We saw a rainbow. When she was leaving to go to Cleveland Clinic for a stem cell transplant. We saw a rainbow. I will let you draw your own conclusions. If you believe the universe is conspiring in our favor then you might believe that my mother sent me this rainbow. If you think it is merely a beautiful coincidence, well, that is quite lovely too, isn’t it? I went back inside. I knew my painting needed one final touch. I added a rainbow. And a quote: love is the bridge between you and everything. Have you had rainbows appear at just the right time? Or other sorts of magic? Feel free to share. Just Follow the Joy! 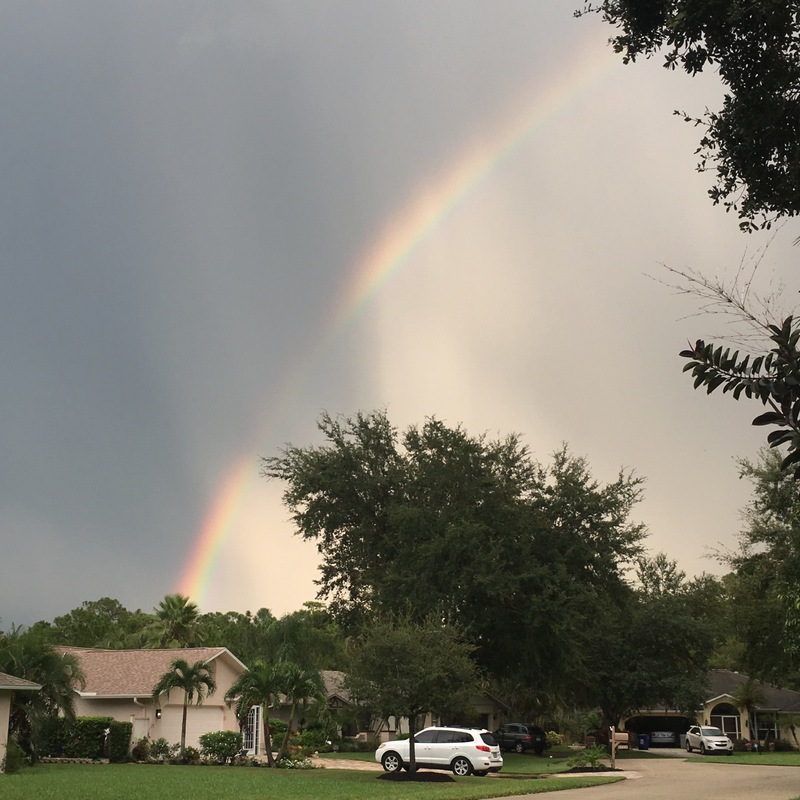 • This entry was posted in loss, miscarriage and tagged blogging, grief, healing, love, meditation, miscarriage, pregnancy loss, rainbows, writing. Bookmark the permalink. Dana that is lovely. Wow what a gift. I love that she was there to urge you on. (And let’s be honest, writing a eulogy is darn hard even if you are a writer!) Thanks for reading and sharing such kind feedback. It means so much.